Welcome to Critic's Notebook, a quick and off-the-cuff car review consisting of impressions, jottings, and marginalia regarding whatever The Drive writers happen to be driving. Today's edition: the 2017 Toyota 4Runner TRD Pro. Cr-r-r-rick-ick-ick-ick-ick. The brakes chattered away as the engine growled to life, and suddenly, we were moving uphill. 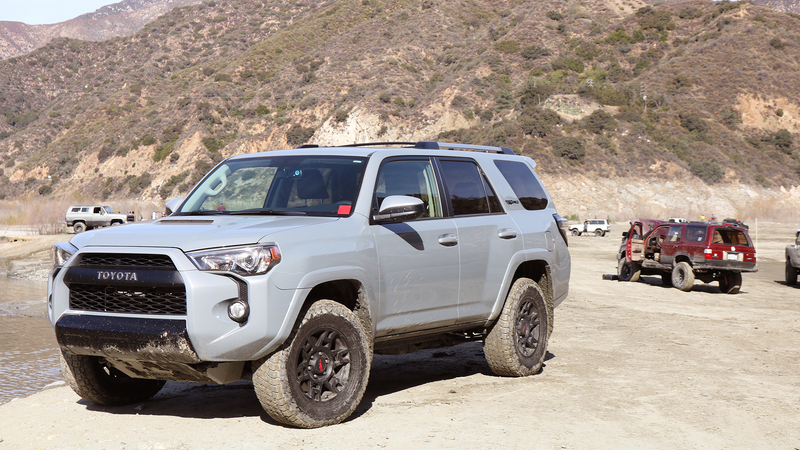 Handing almost full control over to a computer on a technical off-road trail deep in California's San Gabriel Mountains is a very unnatural feeling, and the demonic grunts and groans emanating from my 2017 Toyota 4Runner TRD Pro weren't helping. 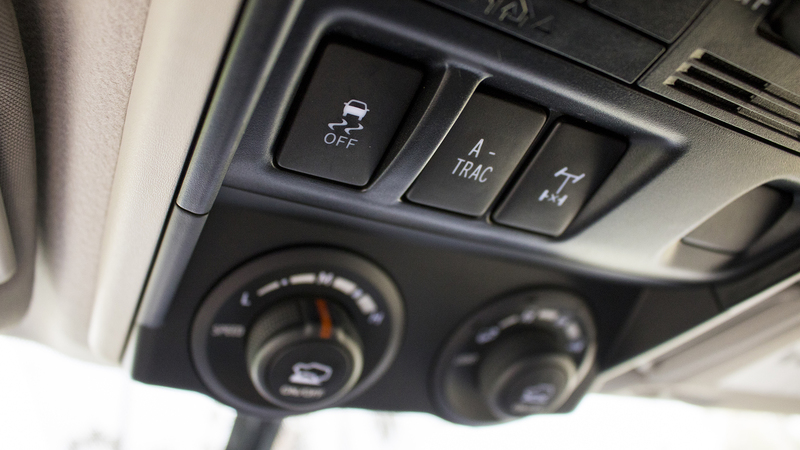 But Toyota insists that its Crawl Control feature—an off-road cruise control of sorts—can handle just about anything you throw at it, and I wanted to see who would crack first under pressure: man or machine? As it turns out, neither. I wish I had a better story for you, but it ends with the 4Runner practically coasting over some deep, offset ruts and crawling its way up the ascent without drama. I won't lie—it felt like cheating. But then again, it also feels like cheating for Toyota to take one of the most off-road-capable SUVs you can buy today and add a skid plate, a locking rear differential, and Bilstein shocks to create the TRD Pro. What else can compete out of the box? Not much. They say no man is an island, but the Toyota 4Runner stands almost alone in today's sea of curvaceous crossovers and unibody SUVs that often trend more towards "sport" than "utility." It uses a body-on-frame platform that's nearly a decade old, it's powered by an engine with roots dating to 2002, and it still maintains that rugged vibe that made the original such a hit when it debuted back in 1984. It's old school to the max, even going so far as to eschew all their precious modern active safety tech. Heck, they'd probably ditch the backup camera if it wasn't required by law. Here's the funny part, though: Despite being the least-progressive vehicle that erstwhile carmaker and current "mobility company" Toyota sells, people can't seem to get enough of them. We bought a staggering 128,296 4Runners last year in America—a record for the model—and this year's sales are already outpacing 2017. Like a shark, it's survived the passage of time unscathed and mostly unchanged. Evolution? That's for things that haven't figured it out yet. 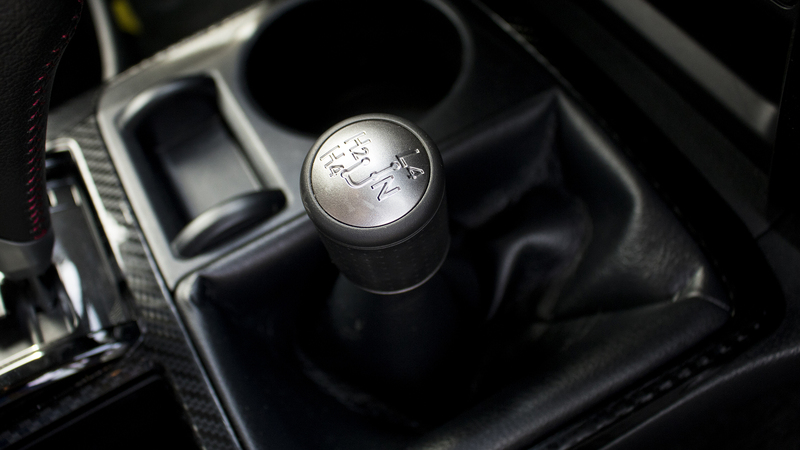 Still, Toyota is testing the limits of its "If it ain't broke, don't fix it" philosophy. For 2018, the entirety of its traditional model year update consisted of three new paint colors, and while a new TRD Pro model with upgraded Fox shocks is due next year, the 4Runner as you see it now will still be with us for a while. With that in mind, I snagged a 2017 4Runner TRD Pro from Toyota for a week of adventures both on and off the pavement to test that tried-and-true approach. What's in a name? 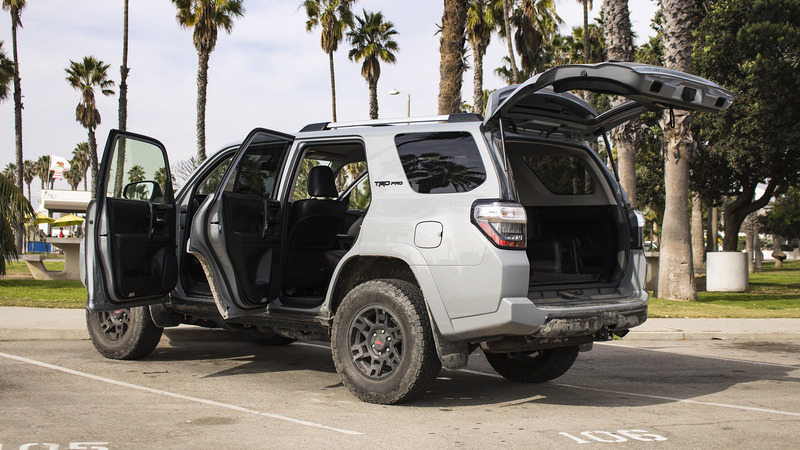 In the case of Toyota 4Runner TRD Pro, a lot of off-road goodies that make it one of the most capable SUVs you can buy turnkey from the showroom. The base model's body-on-frame construction does a lot of the heavy lifting, but the TRD Pro trim gains a special suspension with tuned Eibach springs and remote reservoir Bilstein shocks that raise the ride height by an inch up front and two inches in the rear, as well as an aluminum skid plate and 31.5-inch Nitto Terra Grappler all-terrain tires. It's not as extreme as a Ford F-150 Raptor, for example, but it's still a very impressive factory package, especially in a midsize SUV. 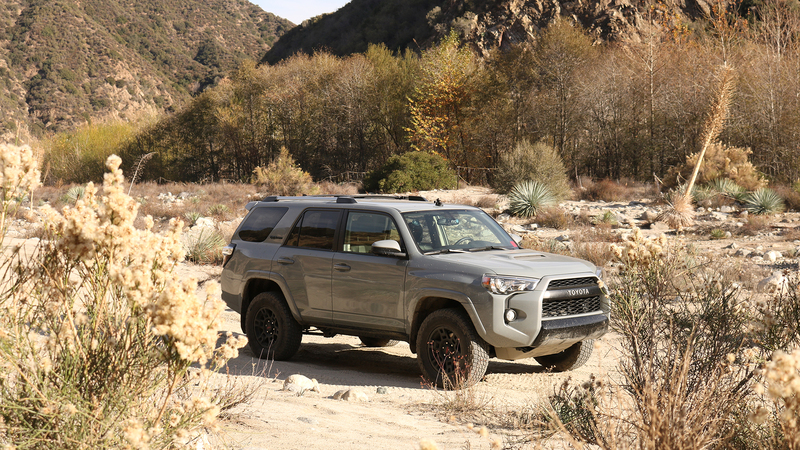 Of course, that off-road ability is aided and abetted by some of the options on the regular 4Runner, all of which come standard on the TRD Pro. There's the rear locking differential, a Multi-Terrain Select system to modulate the traction and stability controls, the company's ABS-braking-based limited slip technology (A-TRAC), and the aforementioned Crawl Control—not to mention the truck's four-wheel-drive transfer case with low range, operated by a traditional gear lever in the TRD Pro. Very little in the way of natural obstacles can stop this truck. You can debate the gimmickry of Crawl Control and Multi-Terrain Select, but they work surprisingly well when pushed to the limit. It all adds up to a great do-it-all vehicle that can hang with the built rigs at an off-road park and blend in with the more civilized traffic on the ride home (minus the copious mud spatters). It's just as capable once you get back to dry pavement, too. 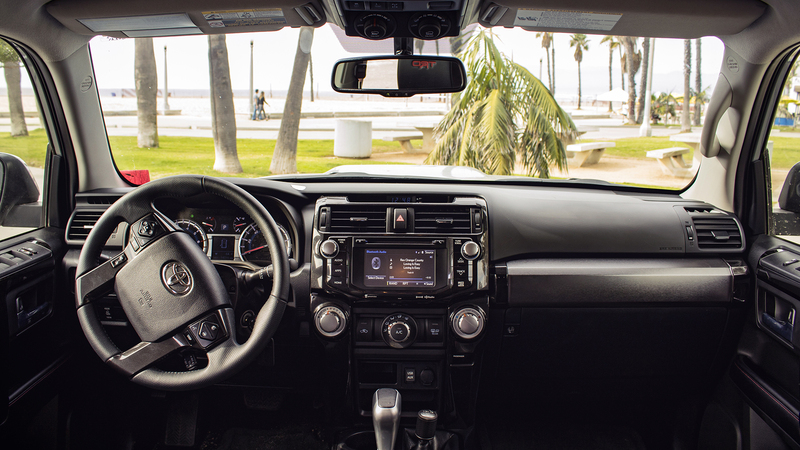 Thanks to its squared-off style and the lack of third-row seating, the 4Runner TRD Pro can swallow 46.3 cubic feet of junk behind the rear seats. 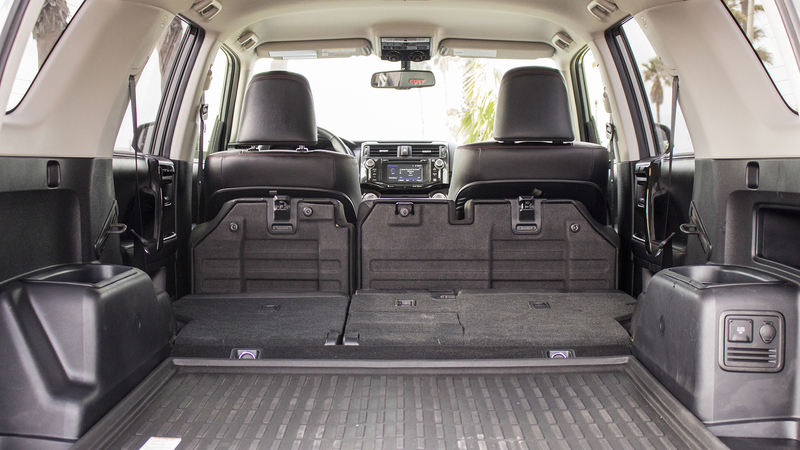 Fold those down, and the flat load floor gives the 4Runner a mighty 88.8 cubic feet of cargo space. That's more than a lot of three-row crossovers out there, which are objectively far less badass (though admittedly, far more economical) than the 4Runner. And all the bonus points to Toyota for maintaining the roll-down rear window, which helps it handle long loads and makes it feel like you're puttering down the trail in an open-air porch. The design is...polarizing, but I'm mostly a fan of how it matches the off-road ethos of the truck. 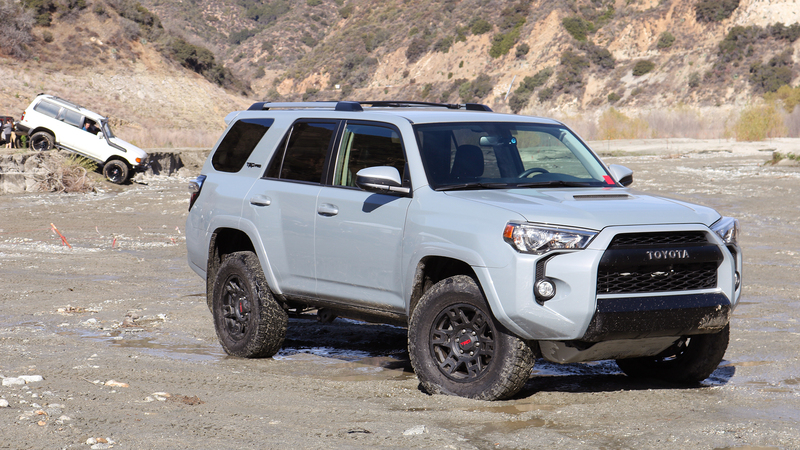 Even though the giant maw up front is accentuated by the blacked-out bumper on the TRD Pro, the aggressive approach angle (33 degrees) and exposed skid plate immediately let you know the 4Runner means business. It's always a pleasure to see the 4Runner's iconic slanted C-pillar, which must be one of the longest-running automotive design features still in production today. And that roll-down rear window necessitates a flatter back end, which keeps it from blending in on a road full of blobs and jelly beans. Fancy trimmings aside, the 4Runner TRD Pro is still a decade-old truck, and it's hard to hide that in some areas. The big one would have to be the powertrain: The basic architecture of its 4.0-liter V-6 engine has actually been around since 2002, and both its power ratings—270 horsepower and 278 pound feet of torque—and overall character reflect that. Though it's rated to tow 5,000 pounds, it sounds and feels stressed under load, and the five-speed automatic transmission is even more dated than the six-speeds Chevrolet is still stuffing in some of their SUVs. It gets pretty lousy fuel economy, too: 17 mpg around town and an optimistic 20 on highway, and those numbers plummet even further off-road. The interior is also a bit of a let-down, despite its relative comfort. Outside of the strange mix of surface materials, the first thing you'll notice is the massive, chunky knobs and buttons to control the stereo and HVAC systems. Functional, yes. Aesthetically pleasing, no. 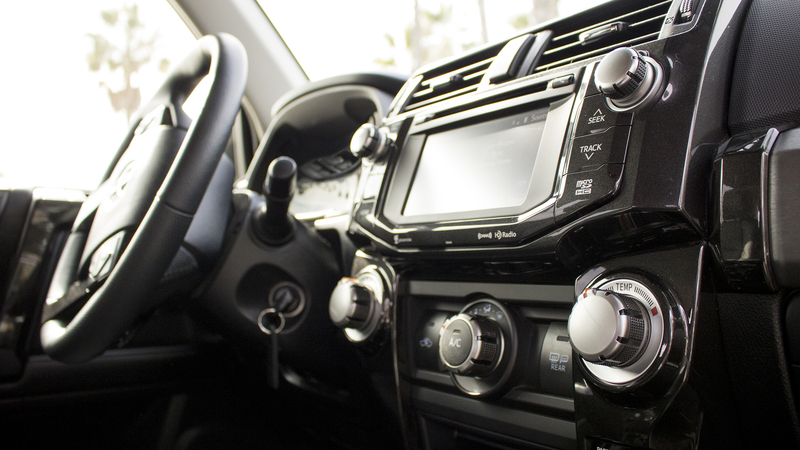 You can make an argument that the 4Runner's interior is designed with its outdoorsy clientele in mind—the big knobs make it a cinch to adjust things while wearing gloves, for example—but the new Jeep Wrangler proves there are ways to preserve that while dialing back the utilitarianism (and fake carbon fiber) a bit. And the 6.1-inch, low-resolution touchscreen that anchors the infotainment system still has no Apple CarPlay or Android Auto support. 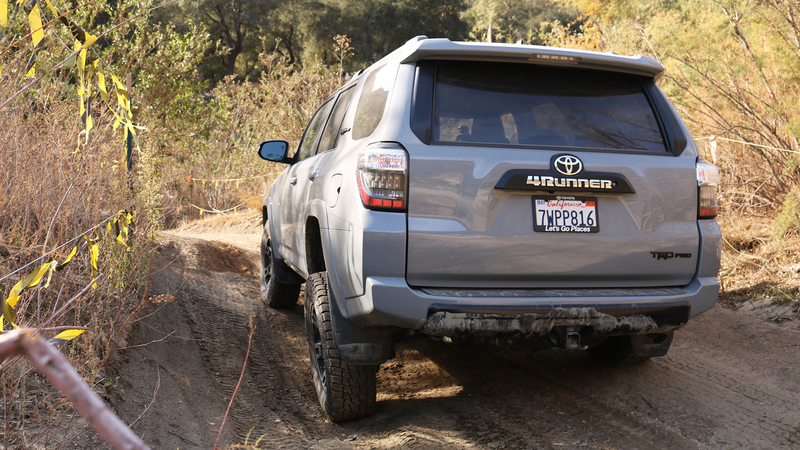 Speaking of tech, there's very little of it on the 4Runner TRD Pro apart from its off-road gizmos. The platform is so old that Toyota can't add any of the active safety tech that's become the norm these days—things like lane keep assist, adaptive cruise control, automatic emergency braking, and blind spot alert. The biggest concessions to modernity are optional front and rear parking sensors. Granted, it's a blessing not to have to deactivate all that stuff when going off road. But riding on that cushy Bilstein suspension and those plush tires, the 4,750-pound 4Runner TRD Pro likes to wander on the road, even with a steady hand. Fire is hot, water is wet, and body-on-frame trucks still handle like pigs. 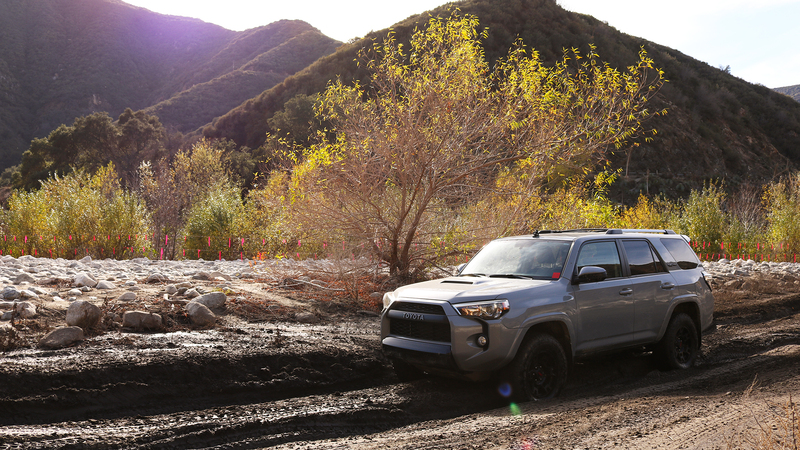 The 4Runner TRD Pro can only do so much to hide its DNA, and the resulting ride doesn't even come close to matching its off-road competence. 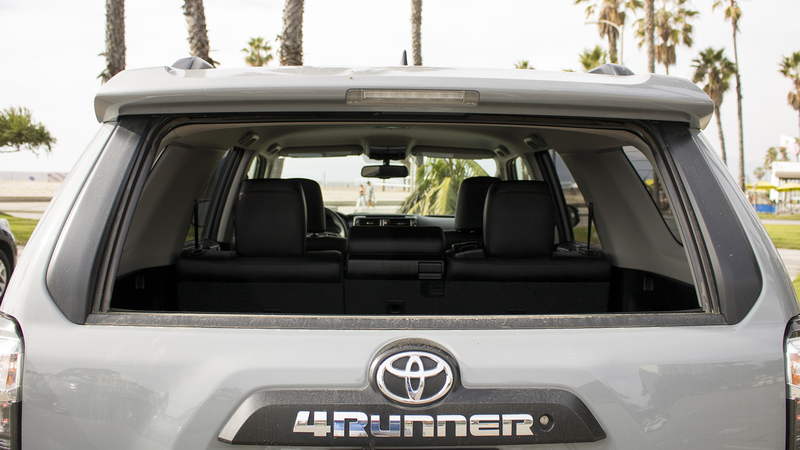 The soft suspension lends itself to body roll, and while it keeps things from getting too jittery for passengers, the 4Runner doesn't reward aggressive driving with anything other than a higher fuel bill. Skid plate did its job. The Toyota 4Runner TRD Pro sits at an interesting spot in the market. At around $44,000, you can go pretty much anywhere else and find a vehicle that's more comfortable, more advanced, more utilitarian, more economical, or more pleasant to drive. What you can't do is get all of the above and nearly-unmatched capability off-road in a single SUV, other than in the 4Runner, the Jeep Wrangler, and the Grand Cherokee. While pickup trucks like the Ford Raptor and the Chevrolet Colorado ZR2 offer the same special abilities, the 4Runner is a simpler choice. Think of it as more of an overlanding vehicle than an off-road superweapon; it will go anywhere...within reason. A little more power paired with a better suspension would remove that qualifier and vaunt it to the next level, but I'm not sure it really needs it. Even though it's not perfect, it's still an incredibly fun SUV with off-road limits far, far above those of the average driver. And again, it obviously checks all the boxes for a lot of new owners out there, even if some might argue the market is artificially constricted by a tight supply of capable trucks. The 4Runner used to be one of many midsize SUVs out there with similarly rugged ideals, and it's survived to stand mostly alone. Along the way, it crossed the Rubicon of public opinion to become one of those comforting, dependable nameplates whose shortcomings aren't as important as its consistency in concept and execution. Toyota knows what's at stake here. It certainly helps that they're all manufactured at Toyota's Tahara plant in Japan, which is the most computerized automotive factory in the world and the source of the famously reliable Lexus LS. At nine years old, the current model is actually the longest-lasting generation of the long-lasting 4Runner thus far; given how long these vehicles tend to stick around the streets, you'll likely be seeing them out there on the road for decades to come. Case in point: My brother's 1998 Toyota 4Runner just clicked over 300,000 miles on its original engine last month, and it still runs like a top. If it ain't broke, why fix (or replace) it?